This Sunday Dinner is a rare one. What do I mean by that? There are no children present. Remote location accessible by pack mule only (o.k. not really, but if you have kids you get the point). Knowing that the children are engaged in fun activities far, far away, naturally one's thoughts turn to---food. 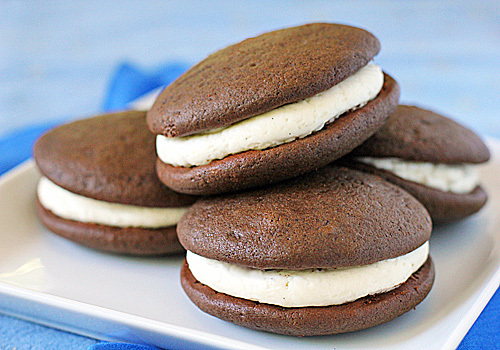 And what first comes to mind is making whoopie ("pies" that is). Bob Eubanks' favorite dessert, the once humble whoopie pie. I say once humble because this Suzy-Q predecessor has recently become one of the "it" desserts amongst the hip culinary set. Don't let the hype turn you away. The reward here is worth the effort. These soft chocolate cakes are flavored with Kahlúa and filled with a vanilla bean mascarpone filling. I enhance the chocolate flavor of the cakes with a bit of espresso powder. The original recipe made 10 pies, but I manage to get fifteen by using a 2-ounce ice cream scoop. Meaning more to enjoy, so embrace its cakey, creamy pleasures. *One note- the pies are best when allowed to set out for about 30 minutes allowing the cakes to come to room temperature and the filling to retain a slight chill. Are you are looking for an out-of-this-world treat to serve to family and friends? Look no further because I have the recipe for you! There are so many wonderful things about these bars. We have two kinds of chocolate, peanut butter, and crisped rice cereal. When brought together, these become the Three Tenors of Yum. They are also great because they can be stored in the refrigerator for up to four days. They won't last that long, but it is nice to make them in advance. The texture is marvelous in the mouth as well. The bottom layer is a candied, crispy, and crunchy base that is slathered with a smooth and creamy chocolate-peanut butter mixture and then topped with a delicious dark chocolate glaze. These are something special. I first made these bars a few years ago for a boy scout troop meeting and a teacher's conference dinner and they were really good, but as usual, I needed to make a few changes to suit my taste. The original recipe made enough for an 8x8-inch pan, but these bars are so good that you'll want to share them. And that calls for a bigger pan. In doing so, I doubled the top and bottom layer, but only made 1 1/2 of the middle peanut butter layer. I felt it was a better chocolate to peanut butter ratio. The other change I made was to brown the butter. Any chance I get to brown butter, I go for it. 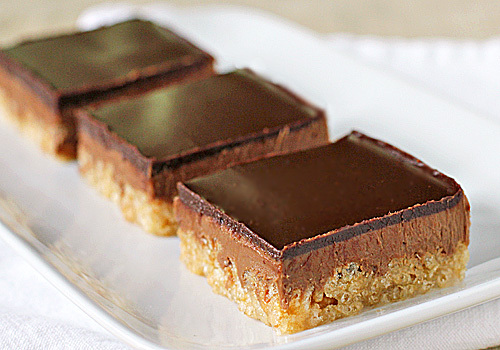 It adds such a nice depth of nuttiness to the bottom layer that pairs perfectly with the peanut butter and chocolate. You can certainly opt to just melt the butter like the original recipe. Any way you make them they will be good! *One note-- these are refrigerator bars. Therefore, they are not good candidates for sitting out on a buffet table on a warm, sunny day. However, when I took them to the boy scout meeting (inside) and the teacher's dinner (inside as well), I kept them covered and placed a large ice pack under the serving trays where they sat for an hour before being devoured. Continuing with some sides for those barbecue meals-- Stove-Top Baked Beans. I make pots of this during the warmer months mainly because I make mounds of coleslaw. What do I mean by that? Not sure if it's a regional thing, but down South, we made sure our food was "touching" on the plate. So when we take a forkful of beans, we also spear some coleslaw onto the same bite. Classic creamy coleslaw with smoky, sweet beans makes for one tasty combination. Growing up, I watched my mother make her beans and it was always a can of beans, a bit of brown sugar, ketchup, some mustard, and a few slices of bacon on top. It was then baked in the oven. I usually have something in the oven taking up space, so I wanted a recipe that I could put on the stove. 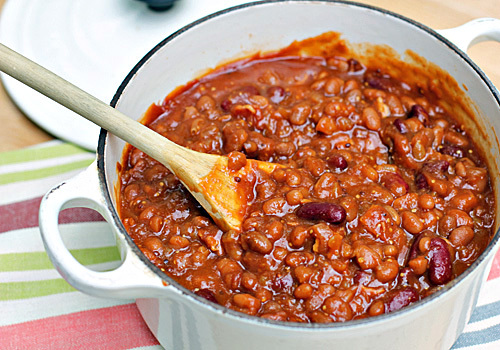 I also wanted a different texture to my beans, so I use a mix of canned baked beans and canned dark red kidney beans. I use my mom's addition of ketchup and brown sugar, but I like the taste of grainy Dijon mustard in lieu of the standard American ball-park mustard. Throw in some onions and sautéed bacon and you've got yourself a perfect pot of beans. The coleslaw and beans are great on their own, but if you are like me and my family and you like your food "touching", then please try this combo with pork, burgers, chicken, or anything else that needs two great sides. Memorial Day is this coming weekend and that means barbecues, picnics, and grill-outs. So, I thought I would share some of my family's favorite sides to accompany those burgers, ribs, and pulled pork sandwiches. 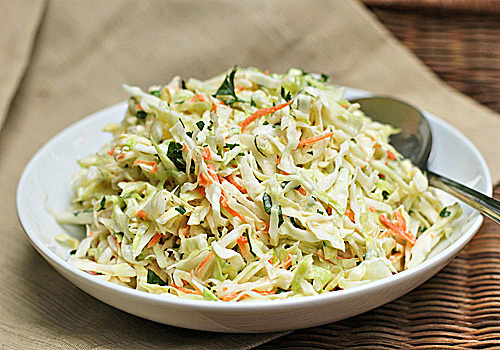 I make mounds of this coleslaw throughout the warmer months. We enjoy it with ribs and chicken, as a condiment to pulled pork (that's right, on top of the pork in the sandwich), and even as a side to a simple sandwich. There are just a few ingredients, but they yield loads of flavor. The original recipe calls for onion, but I like to use the milder scallion. I also add carrot and fresh flat-leaf parsley for color and extra fresh flavor. Sometimes I even sub some sliced red cabbage for the green, but this version is the gold standard. What makes this slaw a winner is the dressing and it has only three ingredients-- Hellman's mayonnaise (no substituting), sugar, and white vinegar. 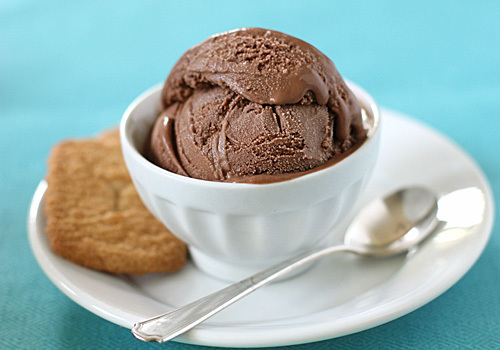 Sweet and creamy-- it is so good! 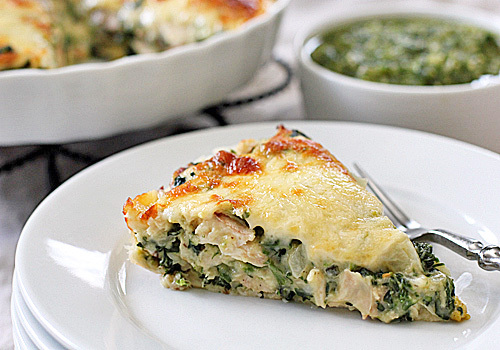 This recipe can easily be doubled or tripled for large gatherings. One tip that I have when tossing such a large amount is to place the ingredients in a unscented garbage bag, twist the top to close, then shake and toss. Works like a charm. We have had a wet Spring here so that means Sunday soccer make-up games and a Sunday dinner that can be made in advance and cook by itself-- sort of. I made the appetizer and dessert yesterday (after Saturday soccer games). The main dish simmers on the stove for several hours until it becomes fork tender. That leaves me peeling potatoes and baking a loaf of bread. Since the dessert is made in advance, I am sharing that recipe and photo today. 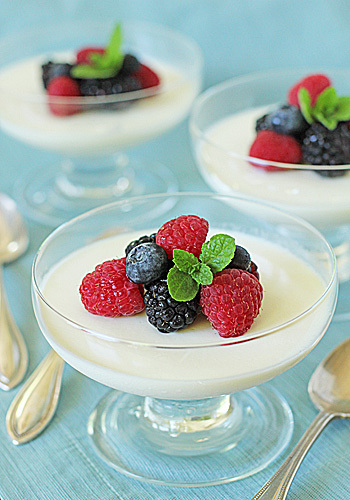 French Creams are creamy white custards that are set with gelatin. I lightened the original recipe and swapped out the mascarpone for crème fraîche because the first time I made these that is what I had on hand and I loved the way it turned out. The creams are sweetened with sugar and their flavor is enhanced with the addition of a little fresh lemon juice and vanilla extract. Topped with fresh berries and a raspberry coulis, they are the perfect ending to our Sunday dinner. The berries at the market have been so sweet and juicy. I realized this week that I had over bought (if that's possible) and some were looking a bit sad. Instead of freezing them for summer smoothies, I decided they would sparkle and shine in these muffins for a breakfast treat. What really makes these muffins explode with that sweet strawberry flavor is the addition of a little strawberry preserves swirled in the top of the muffin before baking. This is as trick that I learned from Cook's Illustrated a few years ago. The sour cream makes them moist but not gummy. The diced strawberries create pockets that burst with sweetness. The streusel topping adds another textural and taste dimension. The added bit of cinnamon in the streusel pairs perfectly with the strawberries. The muffin recipe below is for 12 muffins, but it can easily be doubled. 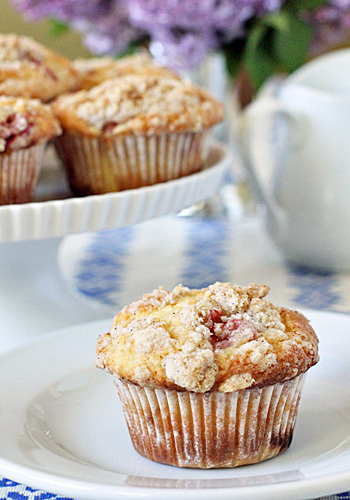 The streusel recipe makes enough for 4 batches of muffins, but you can easily halve it. I go ahead and make the whole batch of streusel and store the remaining portion in the refrigerator. That way when I have a muffin craving, I can pull out the pre-made streusel and proceed with the recipe. After enjoying heavy (but delicious) Sunday dinners, I usually try to serve at least one main-dish salad for dinner on a weekday. This salad is so satisfying that I wind up serving it twice in one week. 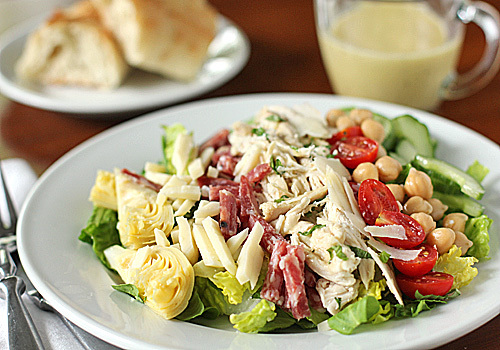 The best description for this salad is Italian antipasto platter meets American Cobb salad. Served with some warm crusty bread, it is a filling meal. It has meats, cheeses, veggies and greens, and it is dressed with a positively delectable vinaigrette that you will wind up dipping your bread into-- it is that good. Eggs-- I love them. I love them softly scrambled, fried, soft boiled, and poached. I love them with a piece of buttered toast, on a bed of stone ground grits, or even over a spoonful of leftover beans. The are the obvious choice for breakfast or brunch, but they are also my go to for a quick and light weeknight meal. This recipe is the perfect example. The eggs are set over a bed of browned hash browned potatoes and topped with dollops of creamy Boursin garlic and herb cheese. 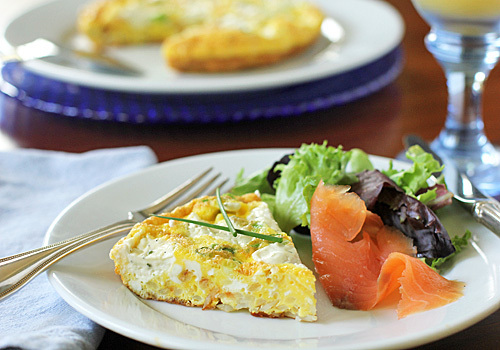 Frittatas are wonderfully versatile from their ingredients to when and how you serve them. We enjoyed the above picture this past weekend for brunch while it was still warm from the oven. We had other items on the menu, so there were a few slices of frittata leftover that I packed for school and work lunches to be enjoyed at room temperature. The original recipe called for frozen potatoes, but I use freshly grated or if I am hosting a large crowd, I purchase the refrigerated hash browns to save time and extra dishes. I also like the taste and texture of Light "Boursin" in lieu of the full-fat. Served with slices or smoked salmon or prosciutto (both equally delicious, but I prefer the salmon) and pinch of cayenne for a little kick, it is a satisfying start or end to the day. The conditions outside right now (50º F and drizzle-- what happened to the 90º F?!) are not very optimal for firing up the grill and smoke box, but only extreme and dangerous weather conditions would stop me from making this meal today. Why?? It is my husband's birthday and I have made ribs for him every year for at least the last decade. As much as I would like to share the rib recipe with you today, the birthday cake is the Sunday feature. 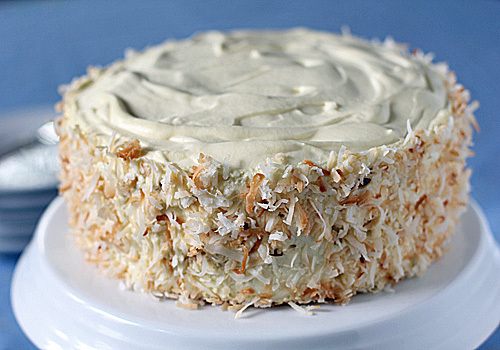 It is a toasted almond sponge cake that is layered with a light and creamy coconut mousse. The recipe requires two 9-inch cake pans and one 9-inch tight fitting springform pan. 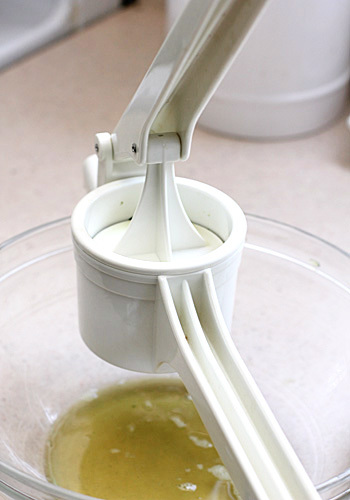 The cakes are sliced horizontally creating four layers, but only three are used. Leave the fourth for snacking;) I added some vanilla extract to the cake batter and some coconut extract to the mousse to bump up that coconut flavor. I also use coconut lite milk in the mousse, but you can certainly opt for the full fat. This cake is the perfect finish to this stick to your "ribs" (pun intended) Sunday meal. It is also nice because it can be made up to a day in advance in order for the mousse to set, which gives me time to tend to the hickory logs and the birthday boy. My local readers know that it has been unseasonably warm here the past few days. 90º F at O'Hare airport on Tuesday?! Time to break out the ice cream maker to cool off. With just two ingredients, this recipe couldn't be easier. It is soft, creamy, and very rich. It's definitely not one of those ice creams where you want to pile three scoops into a waffle cone. This ice cream lends itself perfectly to a moderately sized scoop complemented by a little cookie or perched atop a sugar cone to share with neighbors for an after dinner treat. Get lost in its velvety goodness. We have had a wet Spring here. Good for the grass, but not good for the grill or my craving for beef between a bun. The first time I made these they were good, but they just needed something. I made a big batch, so I put the rest in the freezer for a quick weeknight meal. When it was time pull out that frozen batch, I warmed it on the stove and kept tasting it trying to figure out what was missing. It turns out that the meat mixture wasn't missing anything, but the sandwich was. I like texture, not just flavor in my food so the meat sauce in a bun just wasn't doing it for me. My husband and son suggested onions and mustard. That helped it a bunch, but it still needed something. My son suggested one more thing--bread and butter pickles. I gave him a funny look. Unfortunately, I lost my taste for bread and butter pickles after eating too many at "Happy Hour" as a kid, but I do keep them in the house for the rest of the family. Seeing as how he was right about the onions and mustard (a little mayonnaise doesn't hurt either) I went with it. End result-- "winner winner weeknight dinner" and I can now enjoy bread and butter pickles again! This freezes beautifully, so make a double batch. 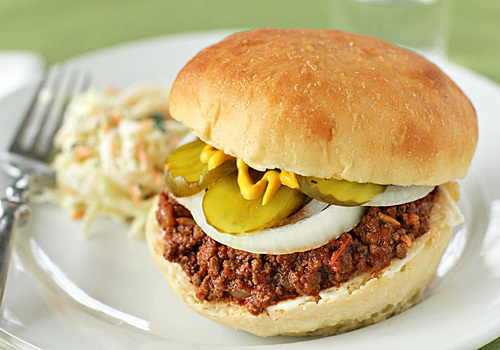 Also, make sure you use a sturdy bun to sandwich the "sloppy" meat sauce. I use my White Bread recipe and shape it into 6 big buns. I highly recommend you do the same. Recently, my mother and I went on one of our "playdates". These are times where we can walk for good health, talk for good measure, and shop for fun kitchen treasures. The book, Chicken and Egg by Janice Cole, where this recipe came from, is our latest treasure. Standing in the back of the store, we each had a copy in hand. Flipping through its pages, I got to page 131 and declared, "SOLD"! She was on the same page. I looked at her and said, "I love you and I want you to have this". My mother looked at me and said, "I love you too and want you to have this". We made our purchases, exchange our treasures, and gave each other a big hug and kiss and laughed. I am not able to be with my mother this Sunday for Mother's Day. To honor her, I wanted to make the recipe on page 131. 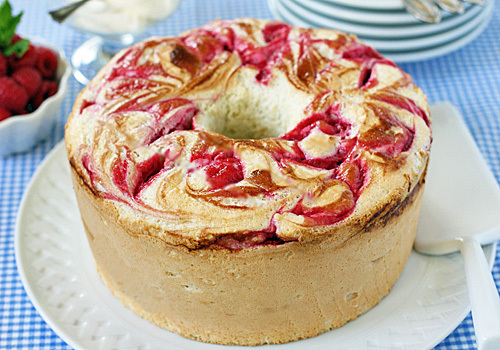 It is a delicate angel food cake that has a sweetened raspberry purée swirled throughout. 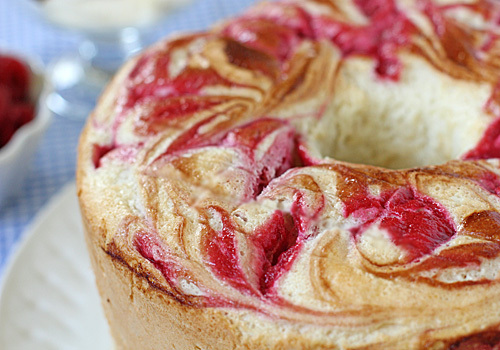 Sliced and served with a whipped crème fraîche-- it is angel food cake kissed by the heavens. My only changes were to add a bit of fresh lemon juice to the raspberry purée and, wanting to keep that "pretty as the picture" raspberry-swirl look, I layered the purée between the cake batter and dragged a long, thin knife throughout to create the swirl. I also made enough purée to have extra to serve on the side. These changes made for one beautiful cake that tastes as good as it looks. The crème fraîche might SEEM like it could be optional, but hoo-boy does it ever bring it to the next level of goodness. The only thing that would make this cake better is if I had my mom with me to enjoy a slice or two. Every time I open this book I will think of you. This is Mother's Day weekend and that means brunch. If you happen to be hosting one or contributing food to one, have I got the coffee cake for you! I became acquainted with this scrumptious cake many years ago through my then boyfriend, now husband's grandmother. 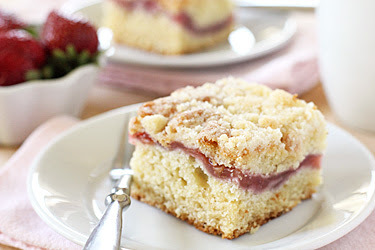 It is a tender, buttery cake that is layered with a strawberry-rhubarb filling, topped with a little more batter, then sprinkled with a sugary streusel. It is moist, sweet, seasonally fruity, and it feeds a crowd. One note on making this cake, the filling needs to be cooled completely before assembling. That said, you can make the filling the day before, refrigerate it, and bring it to room temperature before proceeding with the recipe. Whenever I make burritos, I am always left with one tortilla. Of course I could use it for an after school snack or a quesadilla, but when I came across this recipe inspiration, that leftover tortilla got a whole new meaning. I found this recipe in a Cook's Country magazine where the bottom layer or "crust" utilizes the lone tortilla. The original filling looked a bit bland to me, so I added onion, spinach, chiles, a few spices and some herbs. I serve it with a roasted tomatillo sauce and some Mexican crèma. Mmm--this is so good. It is creamy and cheesy with a little cracker-like snap when you cut through the tortilla crust. So, if you have an extra burrito-sized tortilla hanging around, please make this. Otherwise, put a package of 10-inch burrito sized flour tortillas on your next grocery list and use the leftover nine tortillas for after school snacks, quesadillas, or weeknight burritos. This dish will not disappoint. 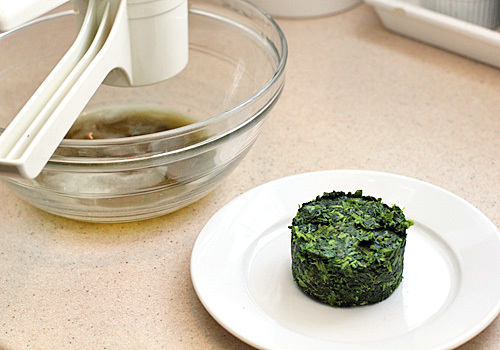 I never used a kitchen towel to wring out thawed frozen spinach. I just did not like picking off pieces from the towel or risk turning my towel green. 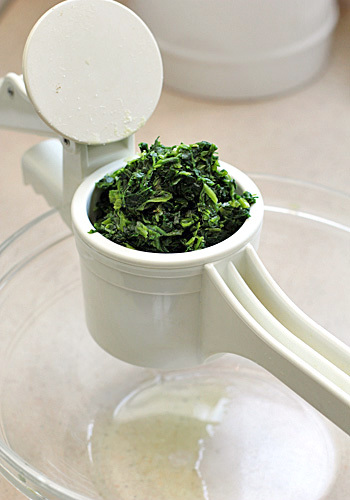 Instead, I pressed the spinach through the holes of a colander. One day as I was pressing, I stared at the stainless steel colander and thought of the stainless steel disk to my potato ricer (a great kitchen tool)--light bulb! I stopped what I was doing and ran to my pantry to retrieve my ricer. It worked so well that this is the method I have been using ever since. 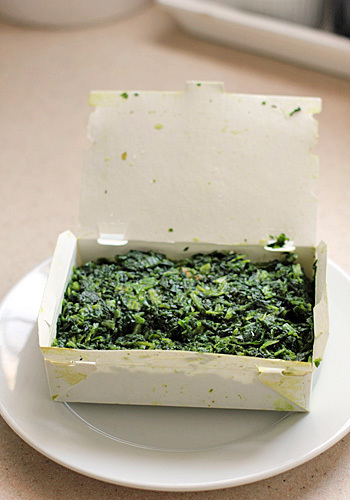 To completely thaw the frozen spinach, place it on plate and let it thaw overnight in the refrigerator. Fit the potato ricer with the smallest hole disk and place it over a bowl. Put the thawed spinach in the ricer and press firmly to squeeze the liquid...and there you have it--perfectly squeezed dried spinach to use as needed. What to do with the little green puck? Stay tuned for a recipe. It is finally starting to feel like Spring in these parts. 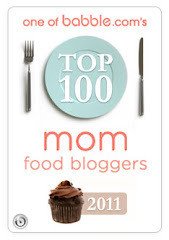 My youngest daughter said to me the other day, "Mommy, look! There are leaves on the trees." She said it like a child from the Deep South might say if they looked out the window and saw snow. Not only are there leaves on the trees, but I now have greenery popping up all throughout my kitchen garden. 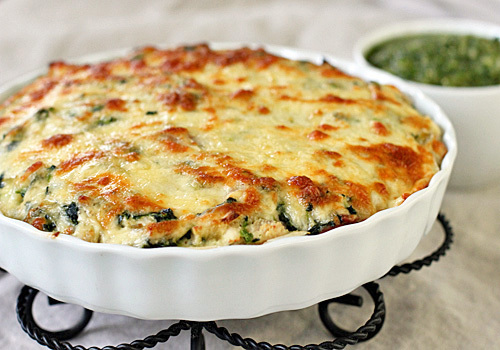 Time to utilize some of those fresh herbs in this delicious and simple appetizer. 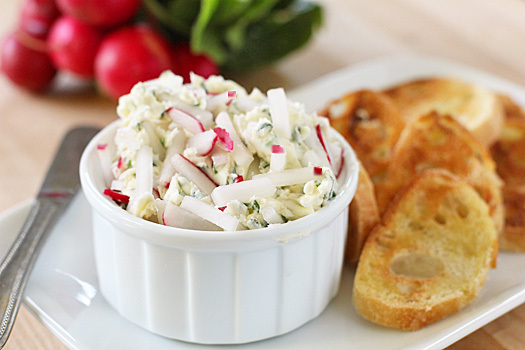 Radishes and butter together form a classic pairing. This recipe takes it a step further by adding fresh herbs and lemon juice for a spreadable treat. I found this recipe at www.greencitymarket.org, the online version of that wonderful farmers' market in the Lincoln Park neighborhood of Chicago. I love spending a few Wednesday mornings down there during the season, but when I can't get there, I visit their website looking for recipes and inspiration. This is a recipe that I found years ago. I hope you like it as much as I do.